Hi there, I am very excited today as this is my first post as a member of The Alley Way Stamps design team!! 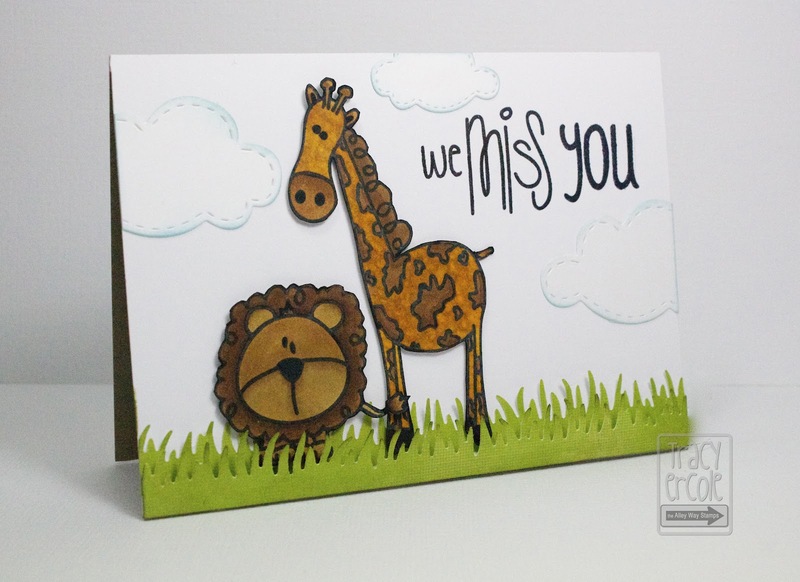 I made the card below using the lion and giraffe from the new Party Animal set, aren't they the cutest! I also used the get MOOvin' and Jibber Jabber sets for the sentiment. Make sure you stop by The Alley Way Stamps Blog if you haven't already, as they are giving away a stamp set each day during their sneak peeks, and you have the chance to win all three new sets during the blog hop coming up in a few days! Check out the blog for further details. I am going to put this card into the latest Here Comes The Boys Challenge #32 as it is a Jungle theme, and the Simon Says Stamp Challenge - Anything Goes. Awwww....they look so sad! Perfect with the sentiment! This is adorable Tracy, love how you've nestled them in the grass! Tracy your card is absolutely gorgeous, super cute animals and I love the clouds. Very cute card, good luck.